Shout out to Gloucester DPW’s Michael Silva and John Harris. This morning they removed all the rocks that were blocking the drainage pipe on Atlantic Road, near the Grapevine Road intersection. 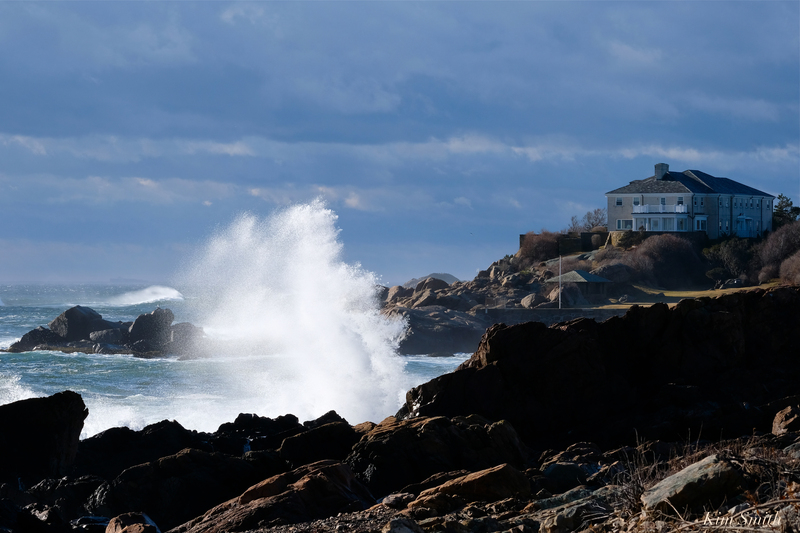 The rocks had been pushed into the drain by the March nor’easters. 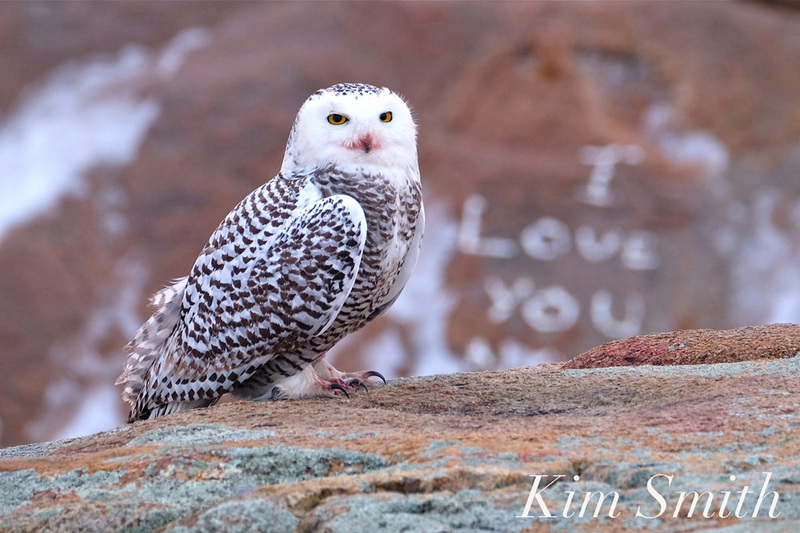 “We Love You Too Snowy Owl” prints for sale. For the next two weeks, I am offering a limited edition of the photo “We Love You Too Snowy Owl.” The 8 x 12 photo will be printed on fine art hot press paper and signed. At the end of two weeks, after orders are in and checks received, I will place the order with the printer. The $95.00 price includes shipping and tax. 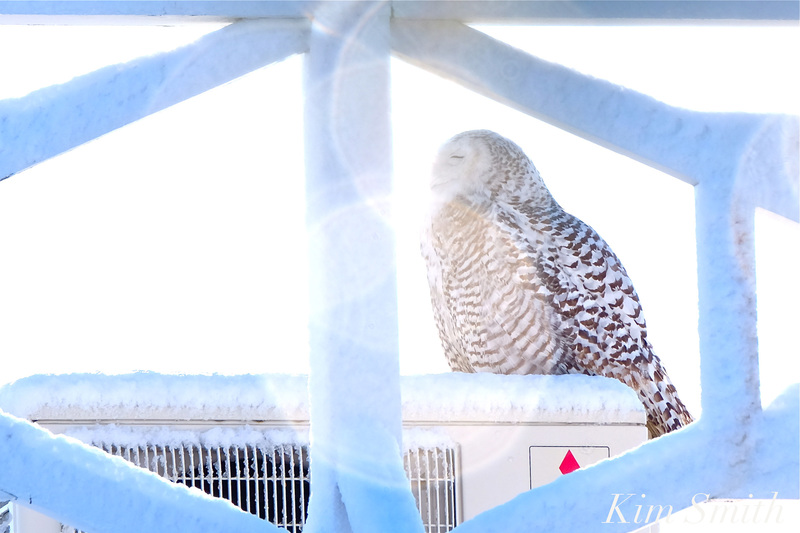 If you would like to purchase a photo of Hedwig, please email me at kimsmithdesigns@hotmail.com Thank you! 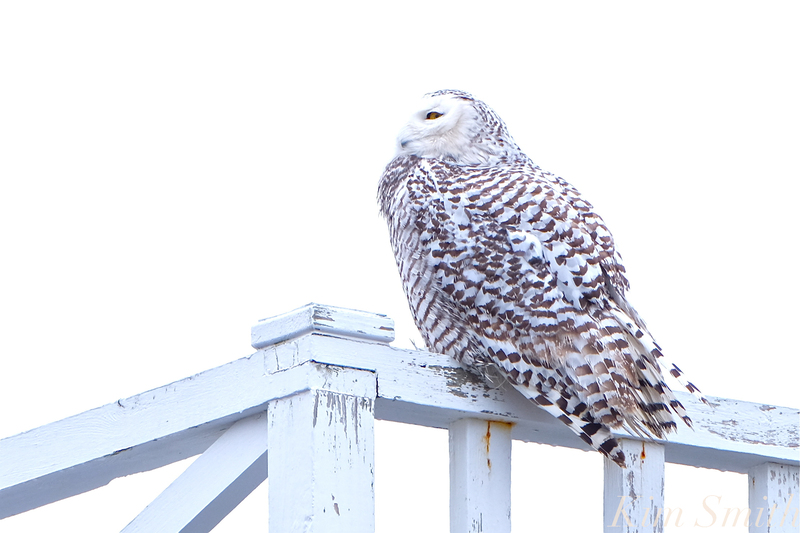 Our beautiful Snowy Owl Hedwig was last seen on Monday night, March 12th. This was also the night before the third nor’easter. 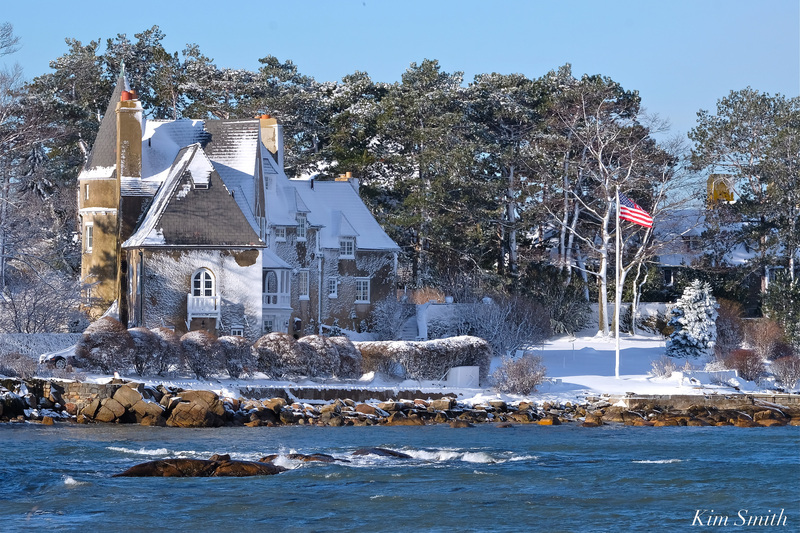 She was perched on the railing of the Ocean House Inn facing towards the sea. The wind was blowing fiercely. Well after dark, and after making several attempts, she successfully flew in a southerly direction out over the water. 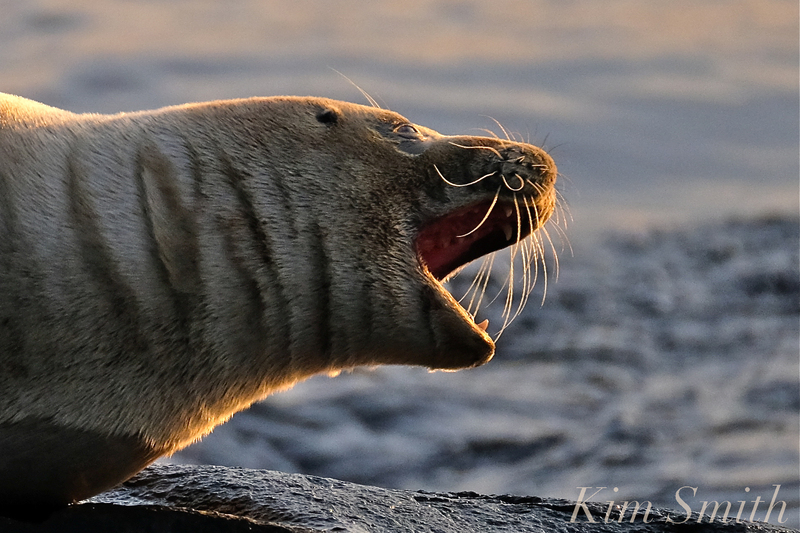 It has been two weeks since that last sighting and perhaps we will see her again, but I imagine her to be safe and undertaking her return journey to the Arctic tundra, well-fed from her stay on Cape Ann. Whether she was well-rested is another story. The great majority of people who came to see this most approachable of owls were respectful and considerate of her quiet space. 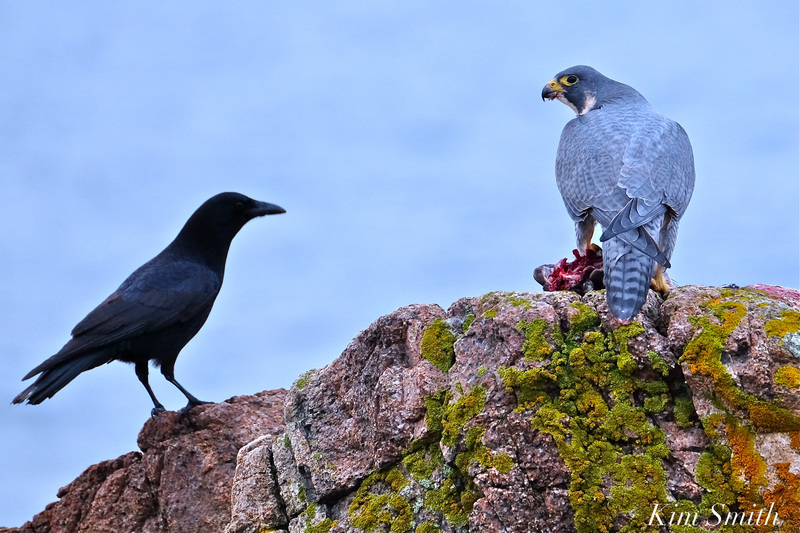 The crows however, were nothing short of brutal. After learning about why crows attack owls, and the degree of aggression possible, I am surprised she lasted as long as she did, and without great injury. Crows and owls are natural enemies because a murder of crows may mob an owl to death (or any raptor by which it feels threatened) and owls occasionally eat crows. Crows are diurnal, which means they feed during the day. The majority of North American owl species that they encounter are nocturnal (night feeding). 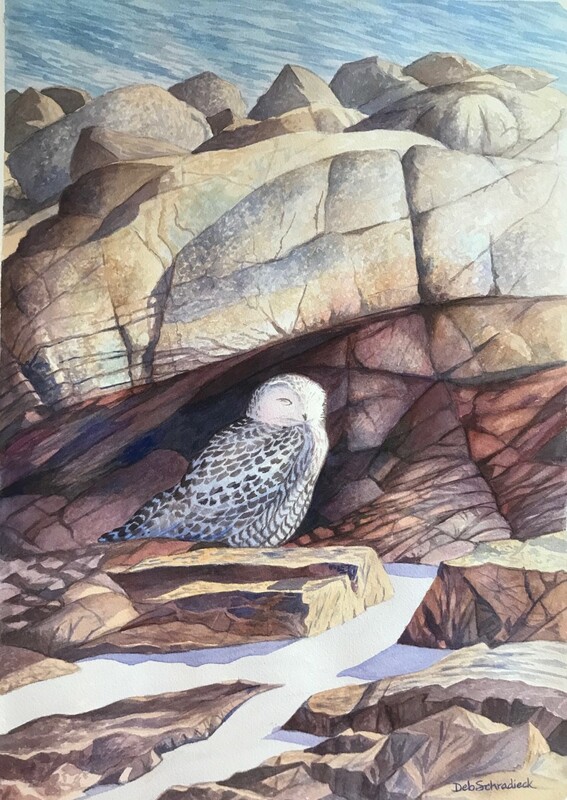 In the case of Snowy Owls, which feed both day and night, their paths may occasionally cross, as happened when Hedwig moved into the crow’s territory along Gloucester’s Atlantic Road. A flock of American Crows can run circles around most owls, pecking, dive bombing, chasing, and in some instances killing. 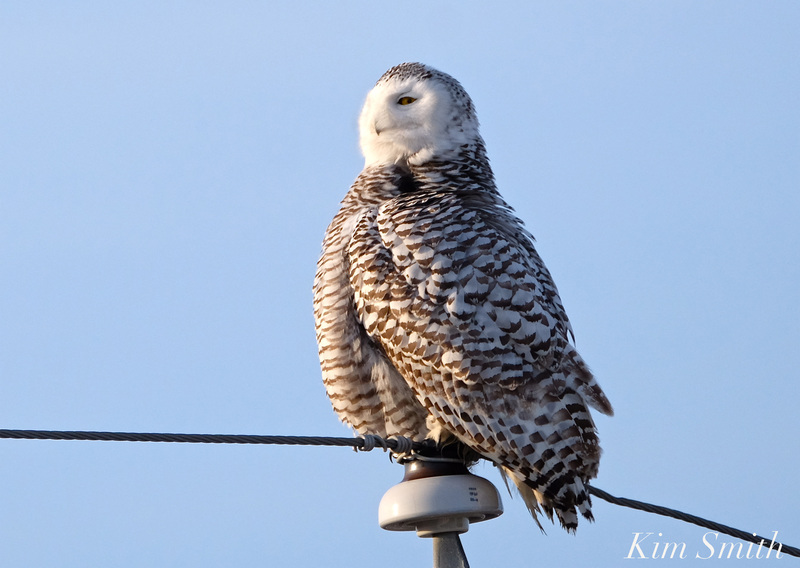 Snowy Owls are the exception; they are larger, stronger, and faster flyers than other North American owl species. And too, Snowy Owls are closely related to Great Horned Owls, a species known to eat crows when they are roosting overnight. So even though a crow in our area may never before have encountered a Snowy Owl, they instinctively know danger is present. 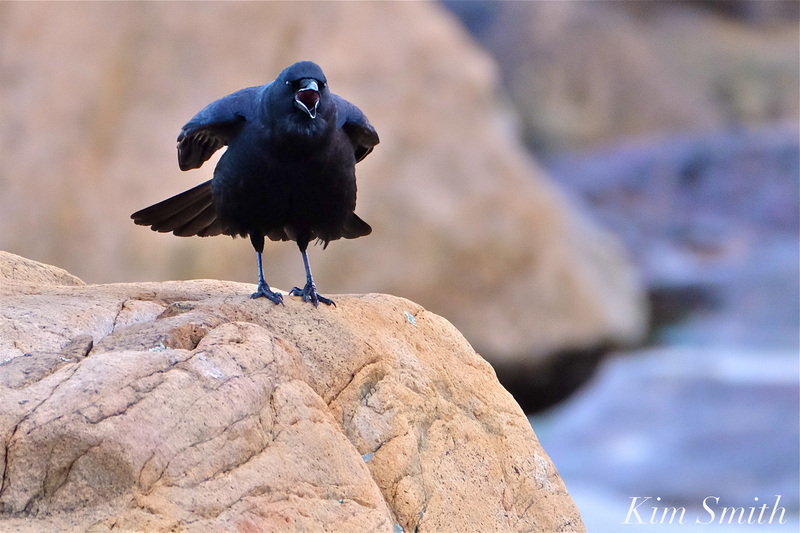 With their incredible ability for recollection, crows are considered the brainiacs of the bird world. Daily, Hedwig outsmarted this smartest of bird species. 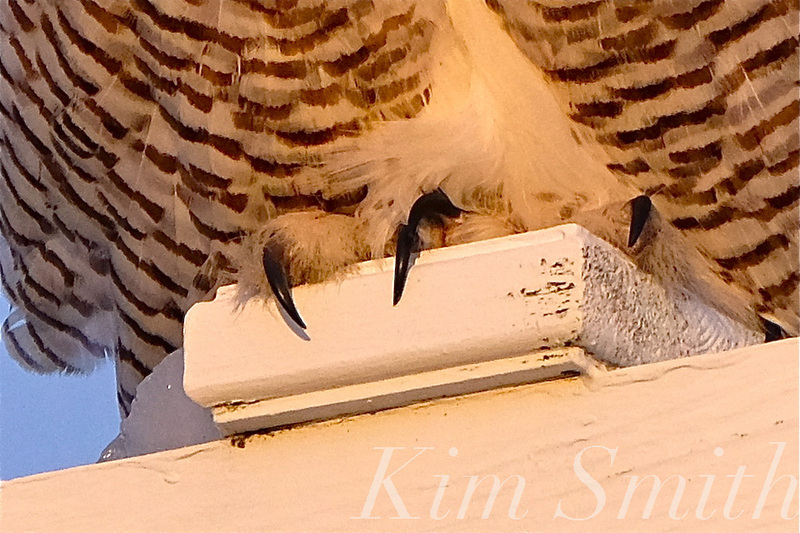 She learned to stay well-hidden during the daylight hours, laying low atop the hotel roofs. Her salt and pepper coloring blended perfectly with the black, white, and gray colors of industrial roof venting equipment. She adapted to hunting strictly at night, after the crows had settled in for the evening, returning to her hideouts before the day began. 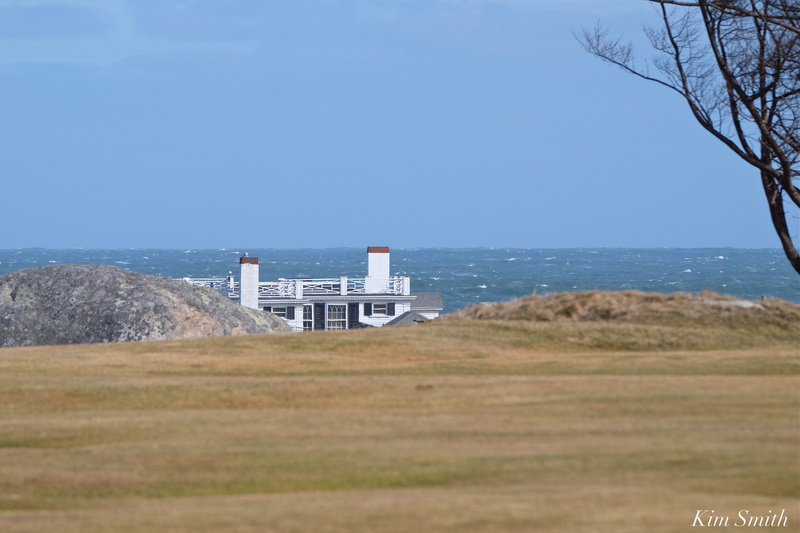 From Hedwig’s perch atop the Atlantic Road hotels, she had a crystal clear view of the golf course and Bass Rocks, places prime for nightly hunting. On one hand it would be fascinating if Hedwig had been outfitted with a tracking device. On the other, if she had been trapped for tagging, she may not return to this area. There is some evidence that Snowies occasionally return to an overwintering location. Next winter I’ll be taking more than a few peeks in the location of the Atlantis and Ocean House Inn Hotels to see if Hedwig has returned. The sale of the “Super Blue Blood Moon Lunar Eclipse Over Gloucester Harbor” photo went very well. 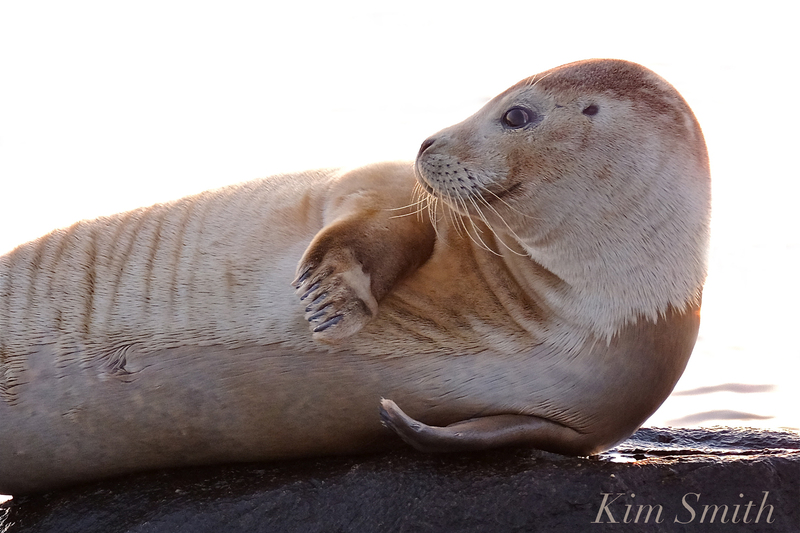 Thank you so very much to all who purchased a print! Many readers have asked about photos of Hedwig. For the next two weeks, I am offering a limited edition of the photo “We Love You Too Snowy Owl.” The 8 x 12 photo will be printed on fine art hot press paper and signed. At the end of two weeks, after orders are in and checks received, I will place the order with the printer. The $95.00 price includes shipping and tax. 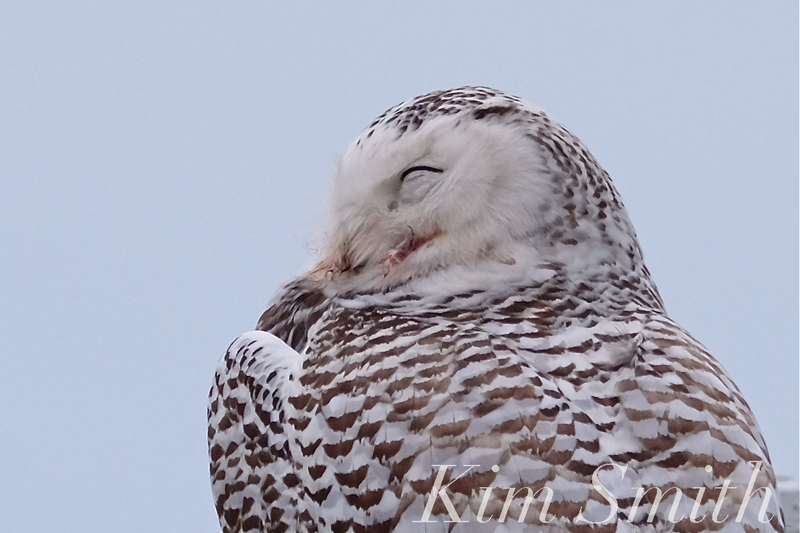 If you would like to purchase a photo of Hedwig, please email me at kimsmithdesigns@hotmail.com Thank you! 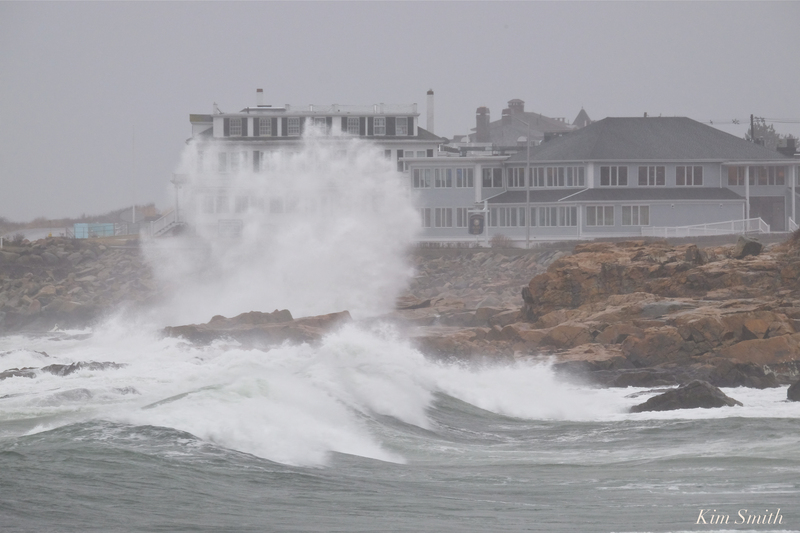 Grateful for the tameness of today’s storm, the fourth nor’easter of March. 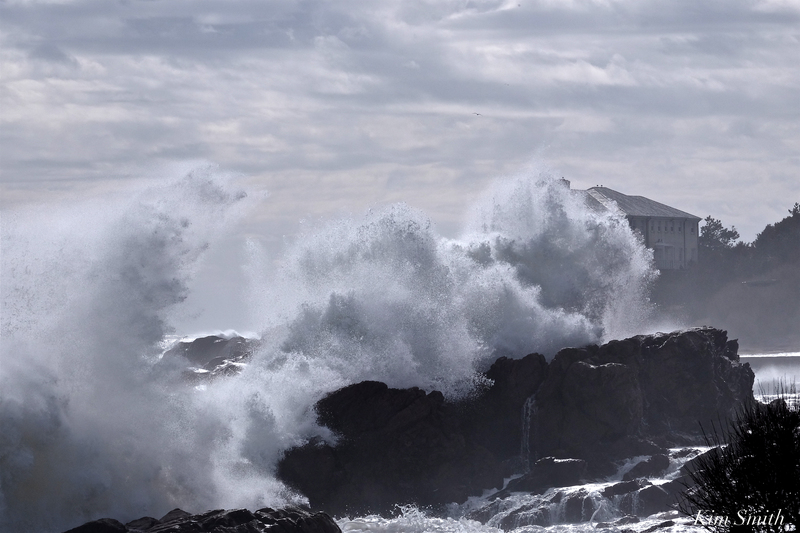 Our coastline has had its fill of damage done. 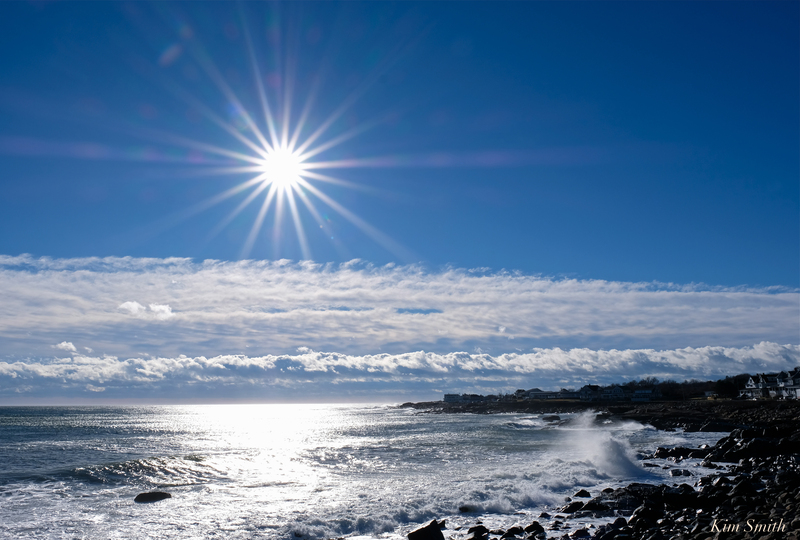 Sunny skies forecasted for tomorrow! 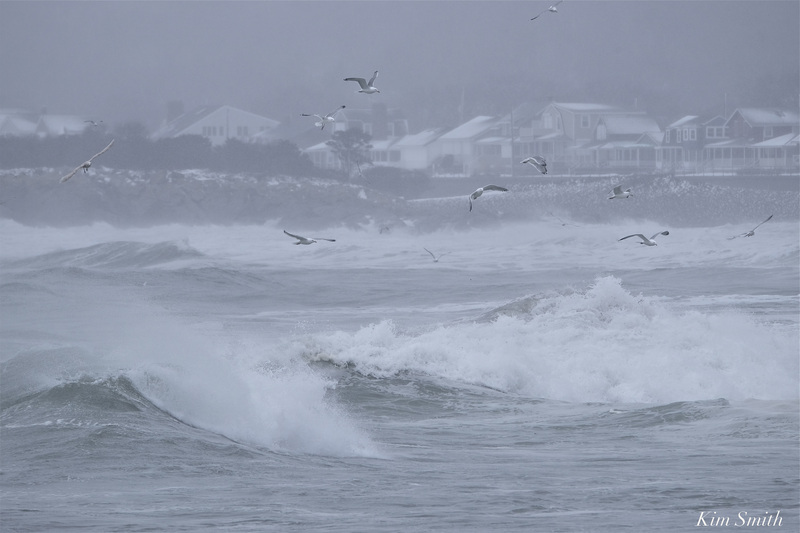 Shoreline, home, and garden have been hard hit by the third nor’easter to take place this March. 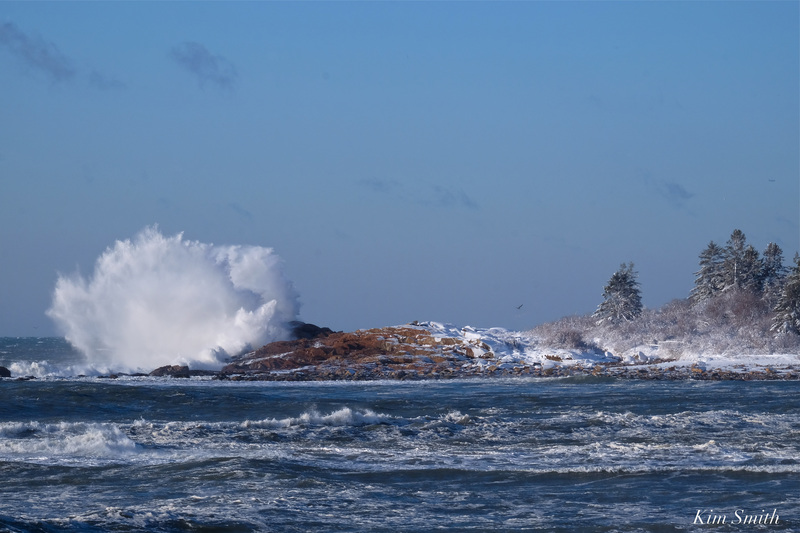 The waves and spindrifts were magnificent, taking a short drive around the back shore this morning, but it was difficult to observe the further damage to coastline habitats. 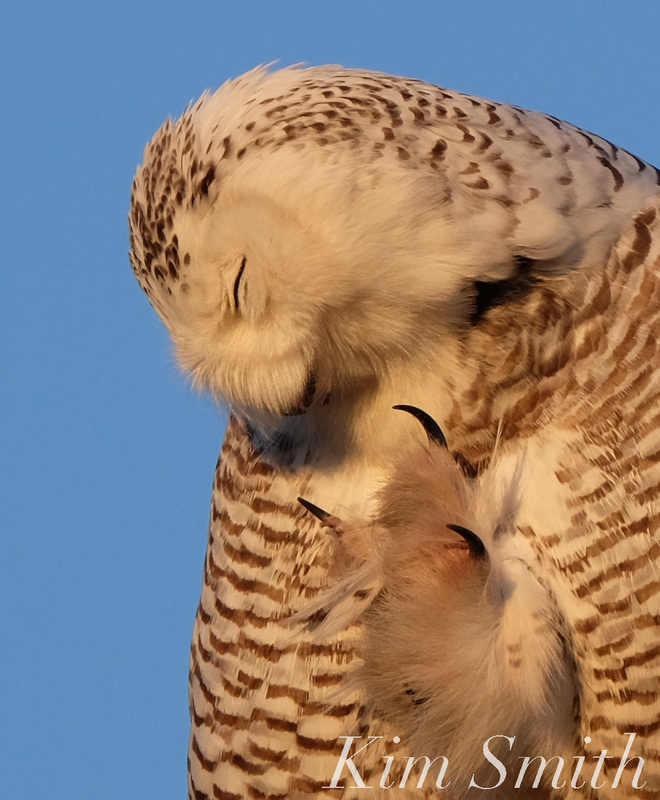 Please bear with me, this post is actually a test to see why the Snowy Owl Hedwig update posted last night is not connecting to the GMG facebook feed. 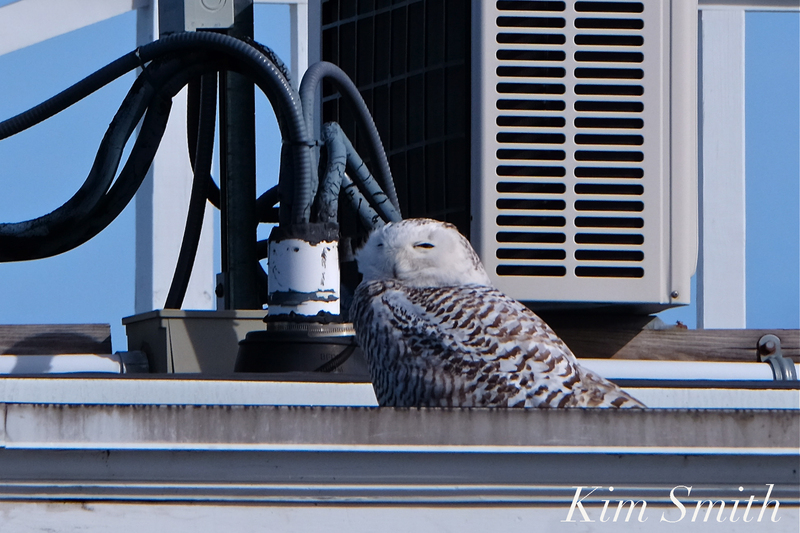 Our beautiful Snowy Hedwig’s routine hasn’t much changed since she discovered the safety zone provided by hotel rooftops (safe from crows, that is). 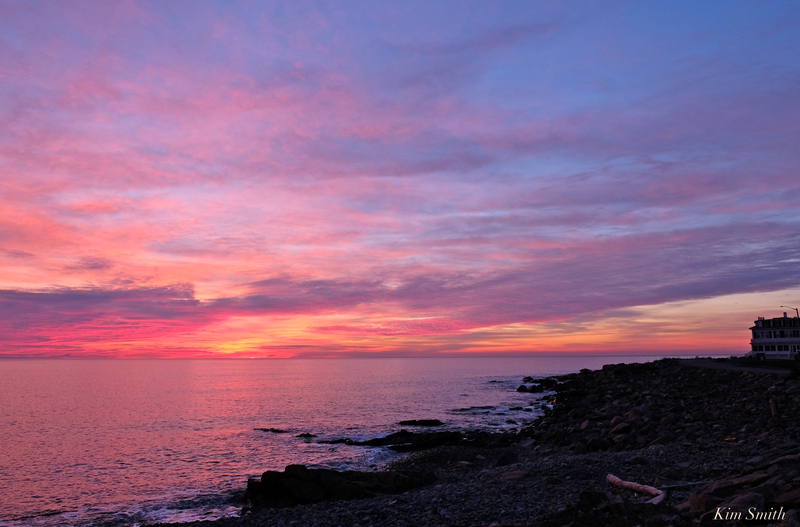 Hunting during the night, returning at dawn to the roof to various well-hidden niches, and then making her “entrance” at around sunset, she has adapted well to New England coastal living. After preening, pooping, and occassionally passing a pellet, she then scans the neighborhood. Hedwig bobs her head in an up and down motion a half dozen times, then flies east over the sea or west over the Arctic tundra-like golf course. 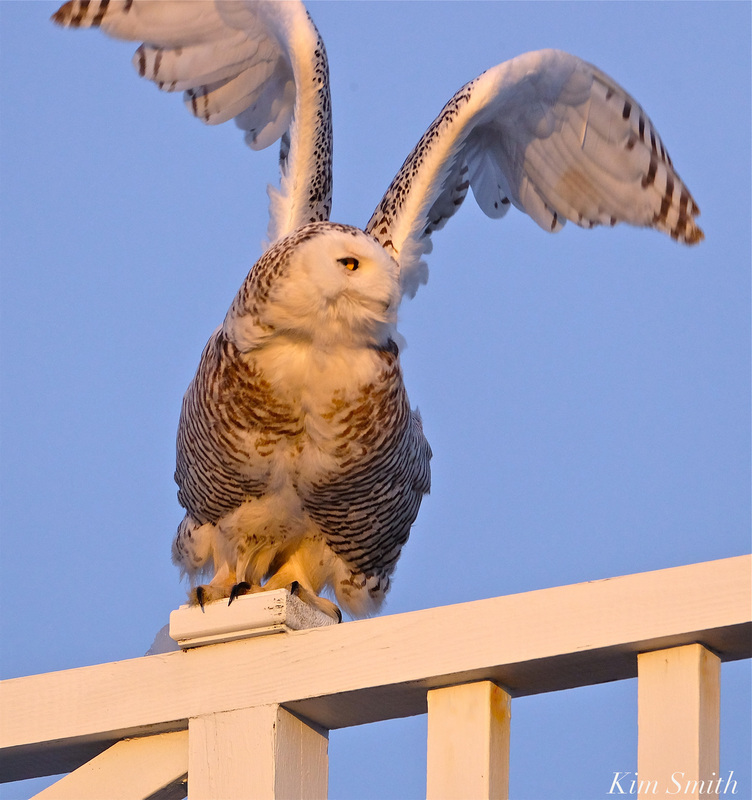 Snowy Owl Hedwig lifts her head in a bobbing motion to track prey. Owls cannot move their eyes in the eye sockets. Instead, they employ several techniques to increase their range of sight. An owl can swivel its head a full 270 degrees. Additionally, owls bob their head up and down, a movement that aids in triangulating potential prey. 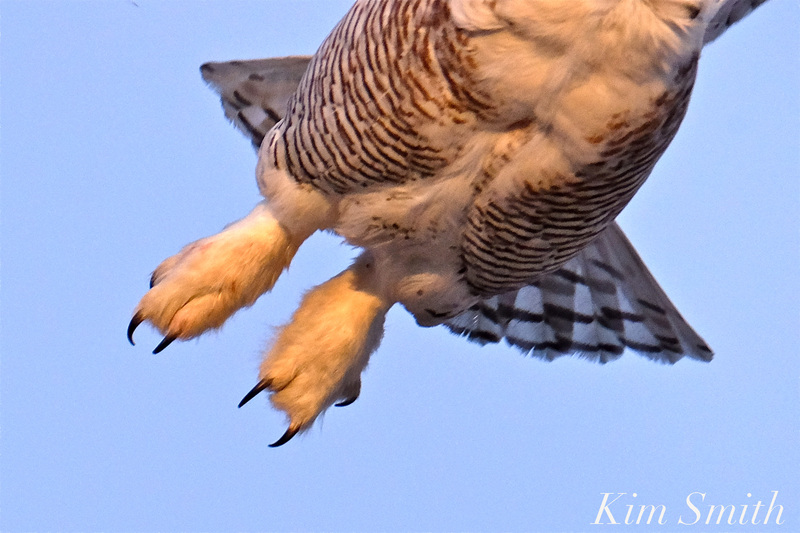 Because the forceful impact of the Snowy Owl hitting its prey is so powerful, combined with the vise-like grip of its talons, the animal usually dies instantly. 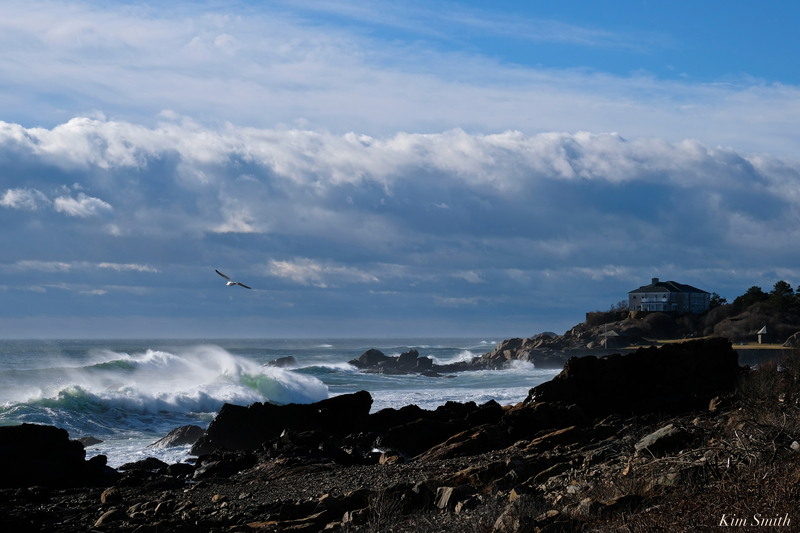 Hedwig has so far survived three tremendously fierce storms during her stay in Gloucester. 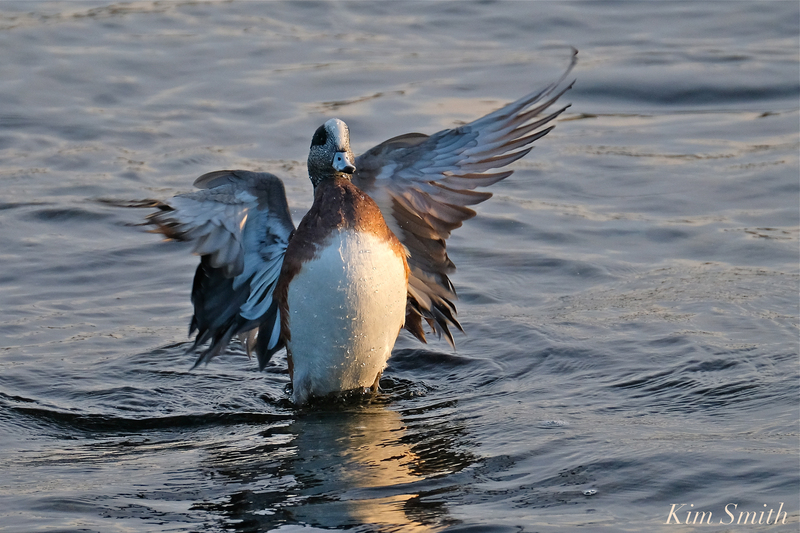 Last night, on the eve of the blizzard, she tried to take off several times towards the water. 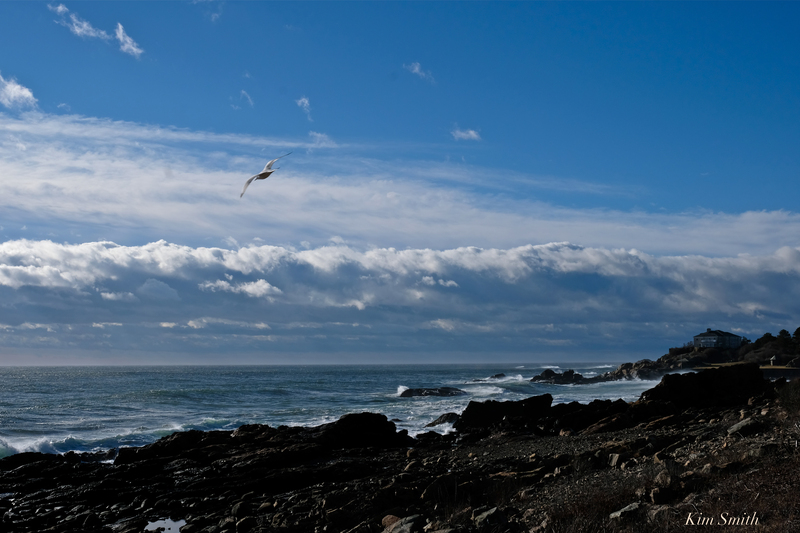 The wind current was strong, but she eventually flew successfully, heading in the direction of Thacher Island. Heres hoping she is waiting out the blizzard in one of her hideaways. Folks are wondering how long will Hedwig stay. Most Snowies leave Massachusetts by April, although one was recorded at Logan Airport as late as July. 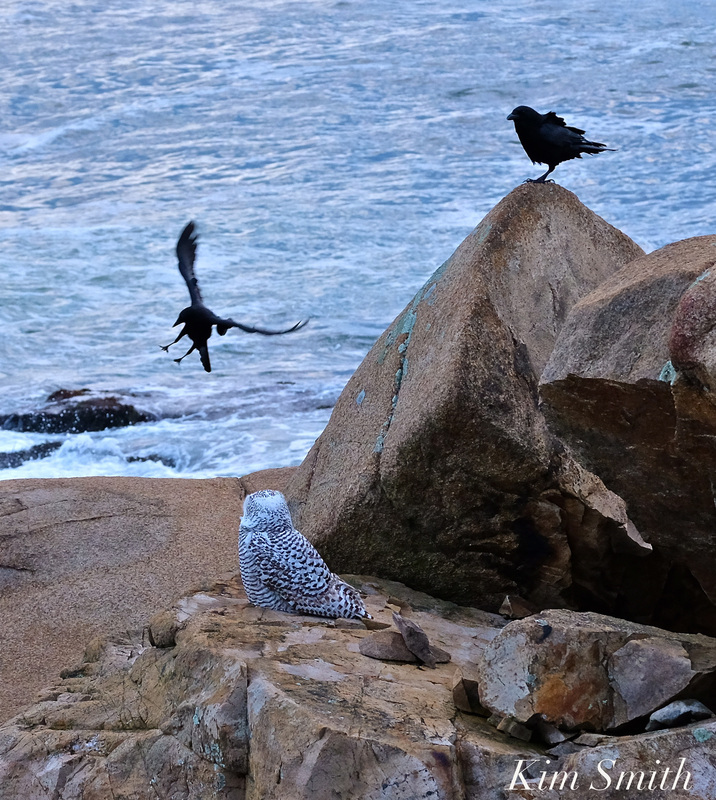 Our winter resident Snowy Owl Hedwig finds plenty to eat along the backshore. Prior to taking off to hunt in the early evening we see her swivel her head and look out to sea, and then swivel around to scan the golf course. We wonder, is she thinking “Shall I have duck for dinner, or shall I have rabbit?” Here she is yesterday morning, face covered in schmutz, a happy sign to see. 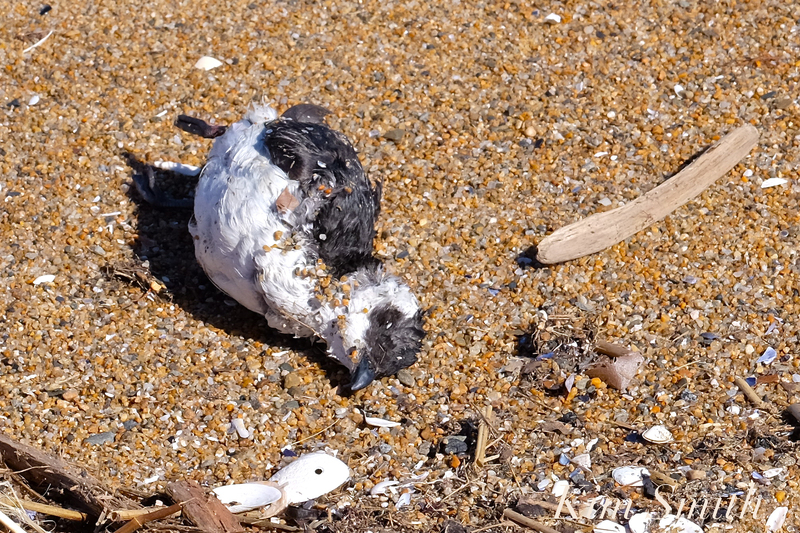 A tiny pelagic seabird, the Dovekie, was discovered this morning laying dead in the sand. I think it must have died very recently as it was completely intact. 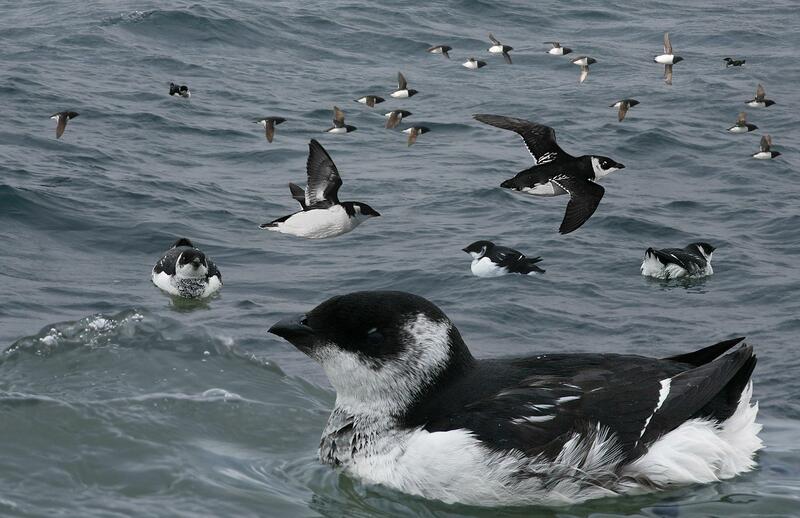 Dovekies are the smallest of the auks (the puffin family) and when on the beach they are in serious trouble because they walk very poorly and have difficulty taking off. Most of us will only ever catch a glimpse of this tiny treasure far away and out to sea and although very dead, it was beautiful to see. 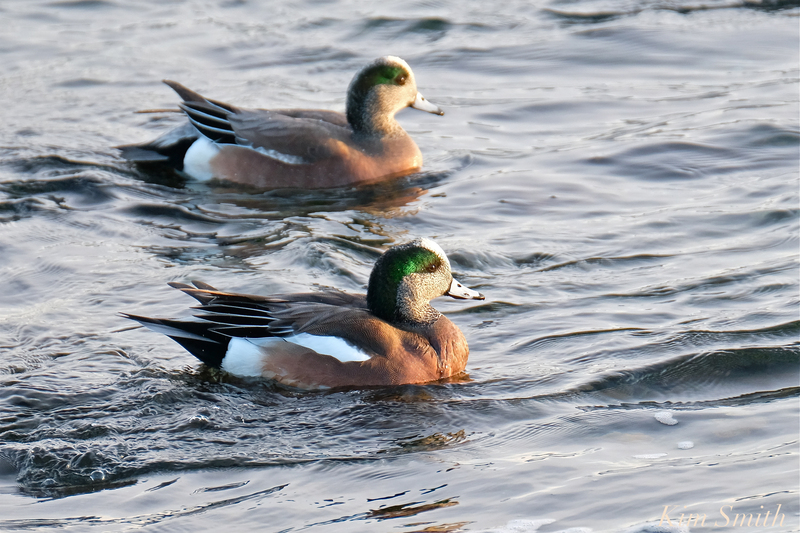 Dovekies (also known as the Little Auck) breed on islands in the high Arctic and move south to the the north Atlantic in the winter. 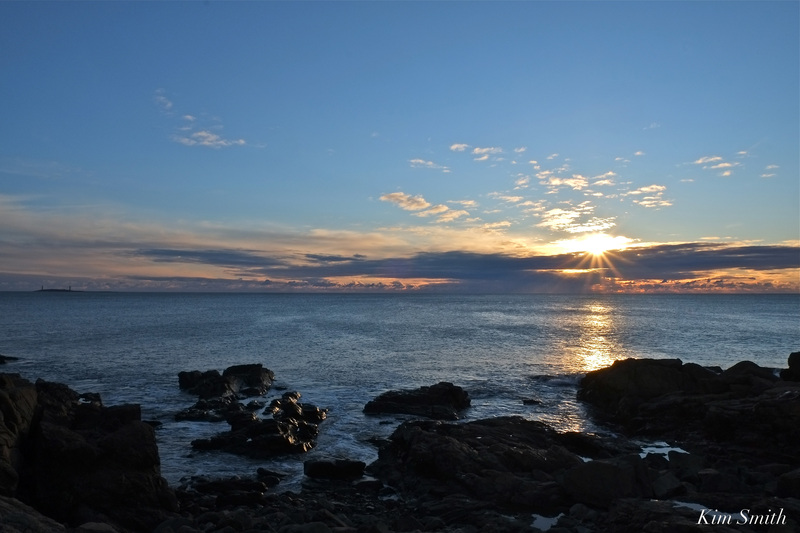 Several weeks ago, one was spotted off the shoreline on Atlantic Road. Photos of living Dovekies courtesy wikicommonsmedia. 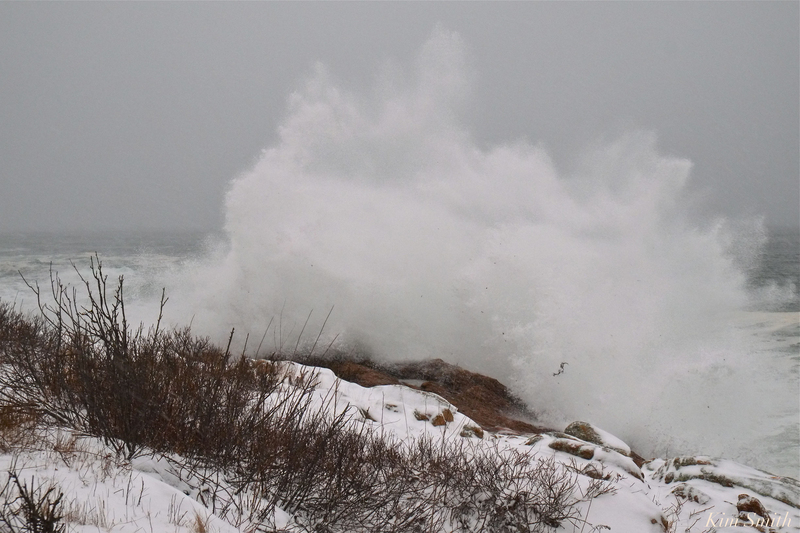 Today during the snow storm at 8am at peak high tide, this is what the exploding surf along Atlantic Road looked like. Cold and windy, with big fat wet snowflakes, it was beautiful nonetheless. STAR POWER – NANCY MARCIANO IN THE HOOD! 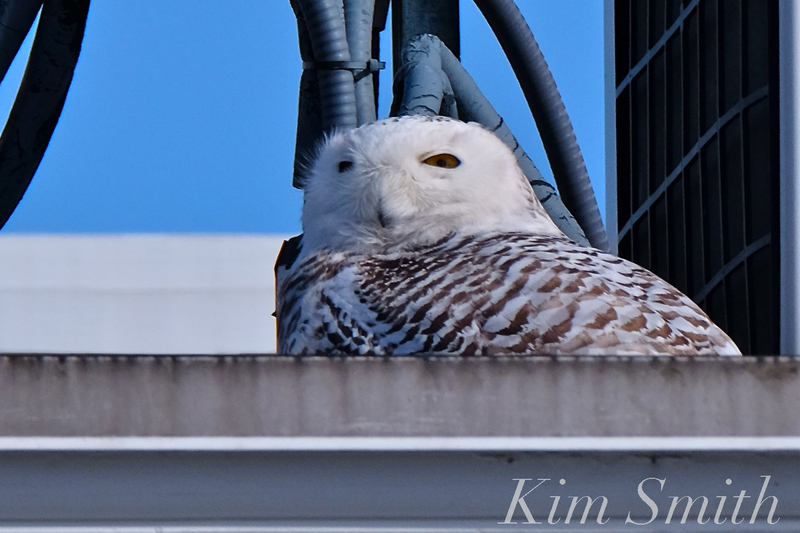 My friend Nancy loves Snowies and especially Hedwig’s story. 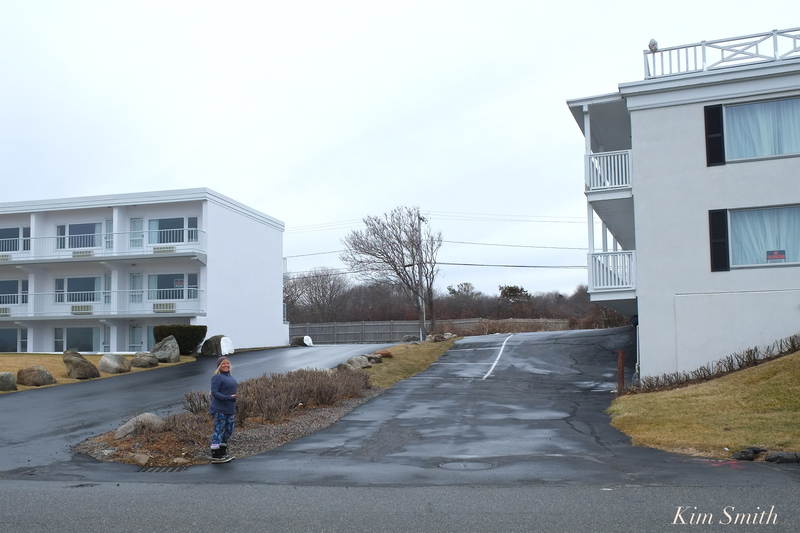 She drove over from Beverly this morning to see if she could see Hedwig and yes, there she was once again, perched on one of her favorite lookouts, the railing of the Ocean House Hotel at Bass Rocks.